The latest developments in East Africa promise to inspire other countries from Africa and beyond.The three countries Kenya, Uganda, Tanzania, represent the biggest economies in the East Africa region, sharing common borders and a history, language, culture, resources and infrastructure. On February 29, March 1 and March 23, 2016, our flagship co-chairs, Sanjeevan Bajaj and Sonia Valdivia, facilitated meetings in these three countries for setting up local networks and developing ‘Life Cycle Thinking Roadmap’ at national and regional level. The meetings witnessed a very positive evolution and momentum for the up-take of Life Cycle Thinking. 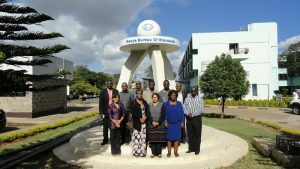 Co-organized by the UNEP / SETAC Life Cycle Initiative and the national Bureaus of standards (Kenya Bureau of Standards, Tanzania Bureau of Standards, Uganda National Bureau of Standards). The national standards bodies are playing a critical role in this process, together with their key academic institutions. Until now, support to build initial capacities in this region had been provided by the Swedish International Development Cooperation Agency and ISO. Main cluster areas where some LCA studies have been developed include the agricultural sector. Main results of the Roadmap discussions include the agreement to setup national networks in 2016 and to co-organize in Kenya the first LCA seminar during the 2nd half of this year. In the mid-term these countries are exchanging information and knowledge to support efforts for establishing LCA networks and expanding LCT. UNEP / SETAC Life Cycle Initiative’s partners are invited to express interest in supporting the first East African LCA seminar, which will be announced in due time.